Poachers are horrible human beings who kill rare animals, often driving them to extinction in order to sate the Western appetite for trophies, or the Chinese and African appetite for medicines or foods of dubious medicinal or nutritional value. Poachers thus add to the destruction of African wildlife and ultimately impoverish that continent in ways that are becoming increasingly obvious. So when I read these stories I wasn't exactly saddened. I was wondering though if the stories were really true. Both stories seemed like something out of a Kipling story. But some fact checking verified that although the events in one story had actually taken place in February, not June, everything else happened more or less as described. So although I am not exactly esctatic that the poachers are dead sometimes that's the only way to stop bad people from doing worse things. The poachers knew the risks and paid the price. Perhaps if more things like this happened humans wouldn't be needlessly killing so many animals. Although there is a certain grim reciprocity in poachers being killed by lions ultimately the only fix is to convince people that killing animals for medicines that don't work or stupid religious reasons is not a good thing to do. And that understanding can't be imposed from the outside of a particular culture. It has to come from within. Otherwise the resentment at THEM telling US what to do is going to outweigh any arguments about the correctness of the actions. And obviously people have to believe that the benefit from poaching isn't worth the cost. That's going to take a while. 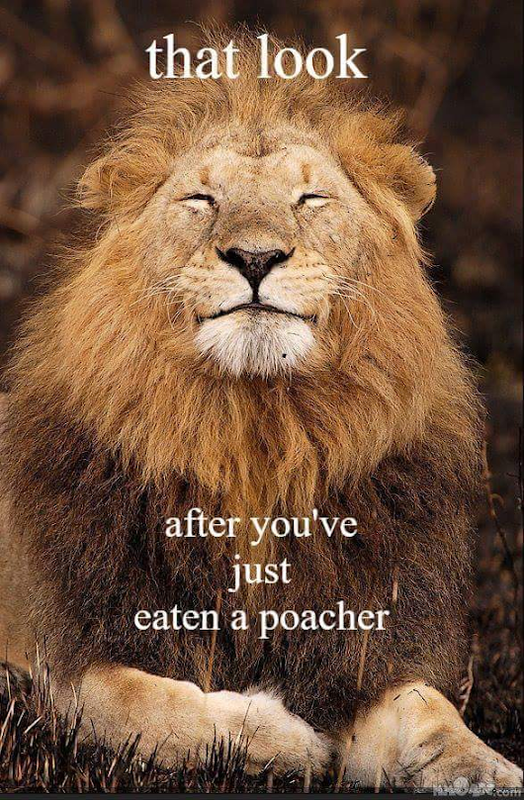 But until then perhaps poachers should tread a bit more lightly. The Lion isn't sleeping tonight. Lions 2 Poachers 0. A suspected big cat poacher has been eaten by lions near the Kruger National Park in South Africa, police say. The animals left little behind, but some body parts were found over the weekend at a game park near Hoedspruit.